whoa. more clicks to open stuff. i mean loads of people still have no idea where their contacts are in gmail today. Sadly, I agree. I only found this out recently when my friends wanted to update their contacts on their Android phones and we had a conversation about it. I told them they can go through Gmail and use the Contacts feature, as the Android contacts are synced to the Gmail Contacts. They had no idea that there was a Contacts feature in Gmail and how to get to it. Even after I told them, I stated that the feature seemed almost invisible. There are enough options for opening other Google sites (bookmarks bar, Omnibox autocomplete, desktop shortcuts, the Chrome menu, this new icon) that I would happily do without a fixed list of a few of them sitting at the top of each page. Yes, please! I actually liked the old menu when they had it last and I abhor the black bar. The blackbar clashes too much and isn't consistent. If added, I would really like to be able to customize what icons are displayed first. AdWords, Analytics, Webmaster Tools, etc... I understand they aren't aimed at the average Google user but I don't understand why Google chooses to "hide" them deep in product menus. All in all it won't change how I use Google's services, considering most are bookmarked or in my history so I just need to type a letter or 2 into the Omnibox. Espero que essa nova interface melhore na hora de um tablet ou celular.. It doesn't look good. It's way too ahead of its time. 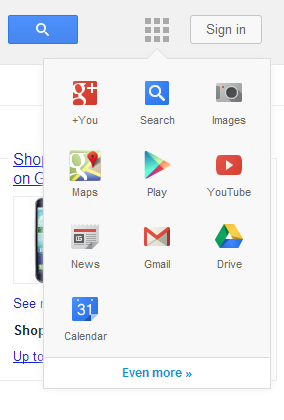 This will make accessing google apps a "two-step" process, as opposed to the original "one-step" process. If we assume that google's core vision is to simplify the user-experience, then this enhancement is currently not justifiable. They should stick to innovating through incremental changes. This is going to look awesome on the Nexus 10 and Nexus 7. 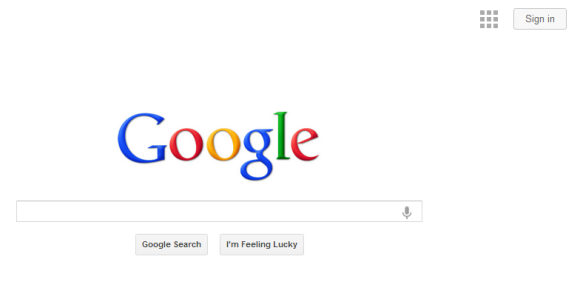 Finally, comeback of the new Google Menu! In my black belt is good and above all faster to use than the drop-down menu. The only thing missing personalization options that can be the example I set in the corresponding order. People want simple interface, i don't think this will be good for the average user. Maybe can be nice for who wants to express more, but for the main user i think it gonna be more difficult to use. Please don't do it. Gostei! Parabéns pelo projeto Equipe da Google!!! I liked the new layout! I don't know why the peoples does not. Anyway, sadly, I also agree that Gmail has very things hidden. 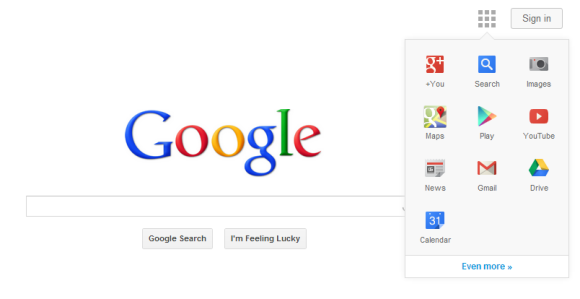 It's need to be more simple, as everything in Google World is! Would be sweet if you can arrange the apps by dragging them - like on ChromeOS! I now have NO black bar OR this new little lovely button! Is it because I had to factory reset my Droid because it would just keep looping? I lost some contacts and my bar....what the...? It doesn't have anything hidden. But it also doesn't show the ugly black bar. Best of both worlds! I think one word in this case is worth more than thousands of icons. So, no. No, no no. No, mister. No..